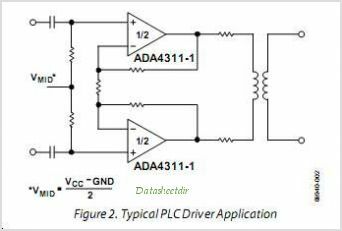 The ADA4311-1 is comprised of two high-speed, current feedback Operational Amplifiers The high output current, high bandwidth, and fast slew rate make it an excellent choice for Broadband applications requiring high linearity performance while driving low impedance loads. The ADA4311-1 incorporates a Power Management function that provides shutdown capabilities and the ability to optimize the quiescent current of the Amplifiers The CMOS-compatible, power-down control pins (PD1 and PD0) enable the ADA4311-1 to operate in four different modes: full power, medium power, low power, and complete power-down. In power-down mode, the quiescent current drops to only 1.0 mA Amplifier while the outputs go to a high impedance state. The ADA4311-1 is available in a thermally enhanced, 10-lead MSOP with an exposed paddle for improved thermal conduction. The ADA4311-1 is rated to work in the extended industrial temperature range of 40C to +85C. This is one package pinout of ADA4311-1,If you need more pinouts please download ADA4311-1's pdf datasheet. 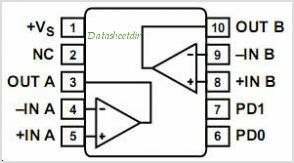 This is one application circuit of ADA4311-1,If you need more circuits,please download ADA4311-1's pdf datasheet.